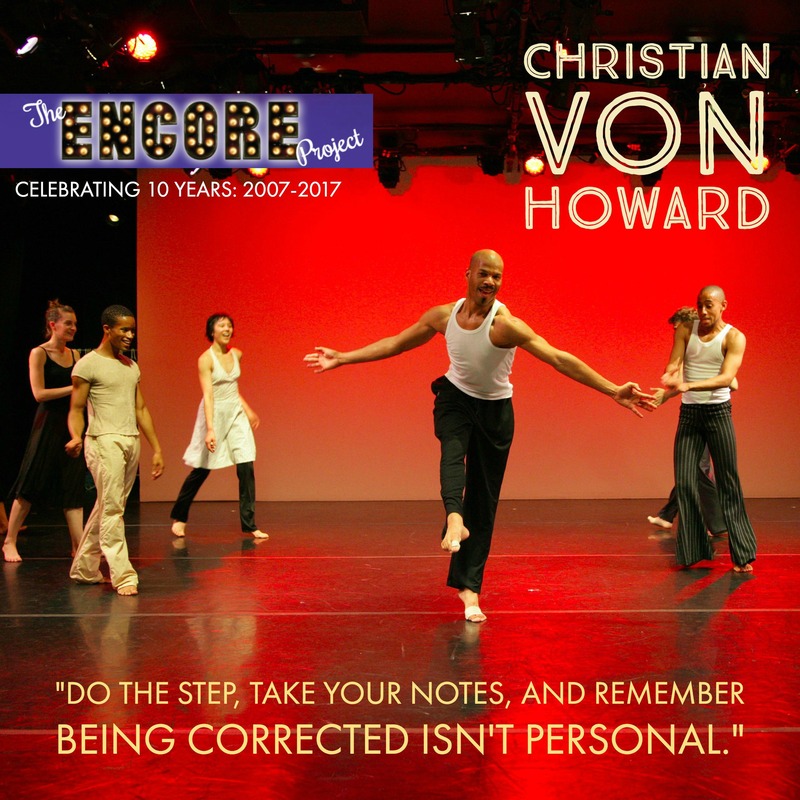 Read Christian von Howard’s Interview! 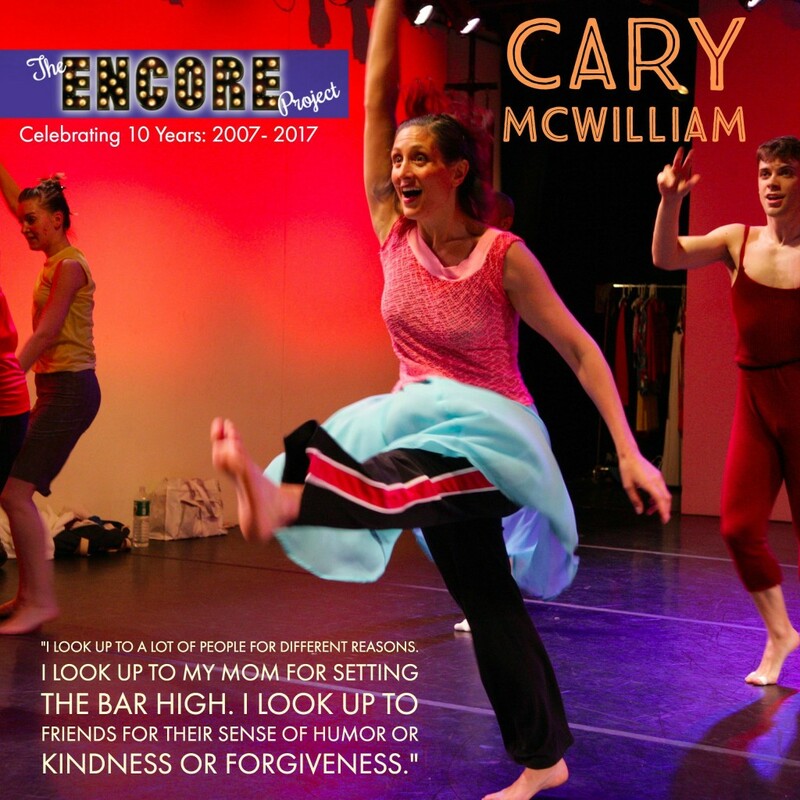 Longtime Company member (1998-2008) Cary McWilliam played the part of the Costumer in the original production of Encore. 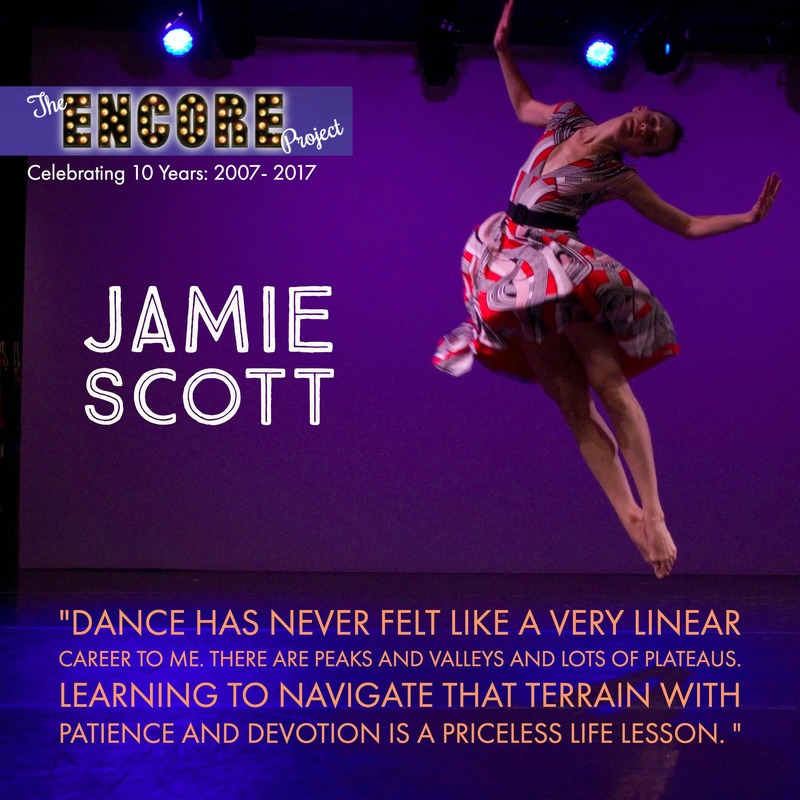 What was your experience like in the creative process of Encore? Do you have a favorite memory? I remember struggling with the speed of Encore. That dance is fast! And half the action from the dance was backstage with all the quick costume changes, which also had to be highly choreographed. I always thought it would be interesting for the audience to see that part too. Where do you see yourself in 10 years? On a beach sipping a pina colada. I am feeling lucky. Do you have a pre-performance ritual? It changed all the time. Sometimes I would have a ginger ale before every show – a drink I would never have any other time. But that didn’t last long. Most often it would be quietly marking though sections or steps I felt needed extra work. Where/What are you doing now? I am not dancing. 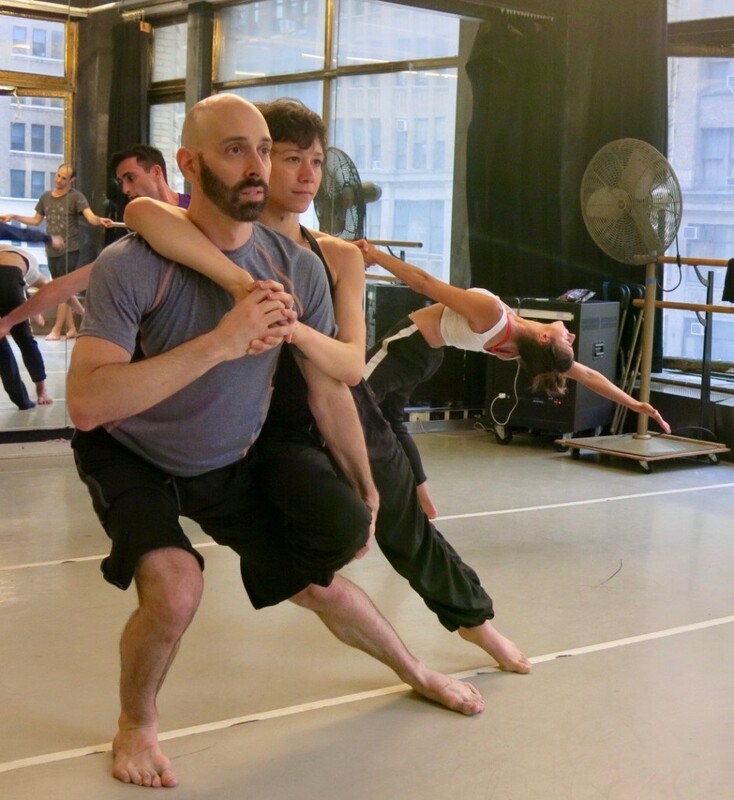 I teach with The Joyce Theater and Center for Arts Education. Favorite style of dance? Well modern dance of course. It’s varied and always surprises me. Maker and Muse: Daniel and Cary circa 2000 in Obsession. When and how did you decide to pursue dance as a profession? I have always danced but it was in college that I had my first real modern class. I was struck. I transferred immediately to a dance major and kept going from there. Favorite dance movie? Oh boy! I was at the perfect age for Flashdance, Footloose and Dirty Dancing. But none compare to the quintessential dance movie – Saturday Night Fever. Holds up over time. Magic Mike ain’t bad either. Favorite food? A fancy salad. What do you like to do when you are not dancing? Rest. The most unusual thing in your dance bag? I don’t’ carry a dance bag anymore. I still have huge bags I lug around though. I could probably find a match box car or a pokemon card in any bag I have. Who is your celebrity look-alike? I used to get Elaine from Seinfeld all the time. Now? No one. Not even that woman from Veep. If you could live anywhere in the world, where would that be? NYC baby! *DGDC Note: Cary does live in NYC, with her husband and son! What was your experience like in the creative process of Encore? Do you have a favorite memory? Felt like I was in on the early ground work that set this evening length work in motion. Served as assistant to Danny on several occasions. Performing the work in Michigan with Danny, Stacy and Jamie! Where do you see yourself in 10 years? Retired!!!! Living in some beautiful place where my friends can come visit. What is some advice you would give upcoming dancers? Be professional at all cost – always show up early, prepare yourself mentally and physically for each day, do your research, immerse yourself in other arts besides dance, most importantly – Do The Step, Take Your Notes, and remember being corrected isn’t personal. How did you get into dance? Through creative movement classes at the recreation center on the Air Force Base where my family was stationed. Do you have a pre-performance ritual? Listen to Music – Go through my show choreography on stage – A series of long breaths before hitting the first step. What is your favorite style of dance? I don’t have one; dance is dance! Do you look up to anybody? Who? My parents and my Colleagues who have been successful pioneers & innovators in the field; young and old. What is a professional goal you have for yourself? Keep making honest work and never apologize for the decisions I make. When and how did you decide to pursue dance as a profession? At an early age. Had my first professional position at the age of 16. Dance was a calling, I haven’t looked back or regretted a moment since. What is your spirit animal? A few different animals as the each have characteristics that reflect me – Cat – Wolf – Turtle – Loyal being the biggest attribute. What is the one question you want answered? When will Trump be impeached? No SERIOUSLY!!! Who is your alter-ego? Big Peach – A little ghetto, to the point, but very sweet. Also know as Cakey to DG. 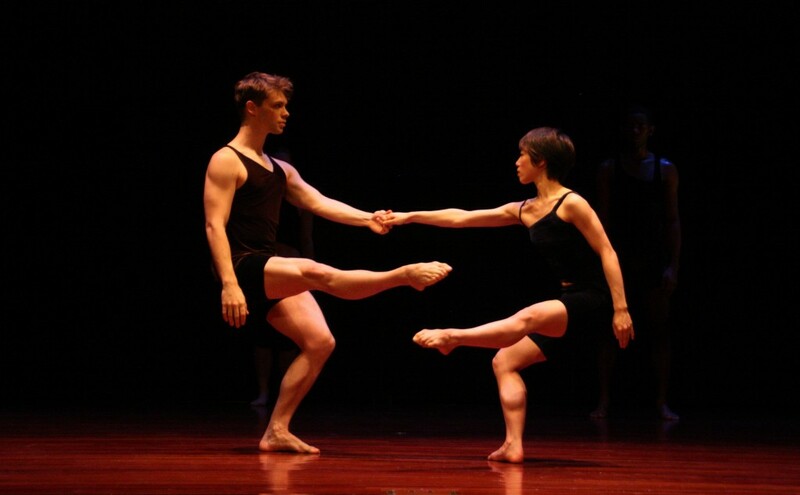 Watch Christian and Daniel, with dancer Jamie Scott, intermingle in the celebrated Embraceable. What was your experience like in the creative process of Encore? Do you have a favorite memory? I was six months into living in New York, and I was challenged throughout the whole creation process. I’d been away from dance for about a year when we started rehearsals. I was exhilarated and nervous to be working with such a great cast and dancing in New York City! Danny’s style was different than anything I’d previously been exposed to, but I also felt like it fit me well. We share a love of jazz music, so my soul was happy to be performing to it. A favorite memory: getting Congo! Michael and I worked it into the ground. And I loved watching the improv section with the hat. It felt so natural and easy on stage. Not like a performance at all. Where do you see yourself in 10 years? I see…I’m living outside of New York – somewhere with a yard, and ideally a porch swing. I’m working at a university teaching aerial and circus history. I have two kids, and maybe a dog. I think I’ve written a circus book…. What is some advice you would give upcoming dancers? Drill it. Drill everything. Night and day. The speed can feel restrictive, but the ease and joy will come when the moves are ingrained in you. How did you get into dance? I’ve always been pretty wiggly, so my parents put me in classes at a local studio when I was 4 or 5. Then my mom sat 6 year old Madeline down for a very serious conversation at the dining room table. “You have to pick: dance or gymnastics.” At the time I was doing both, and she could foresee complicated (and expensive) teenager years with competitions and touring. I picked dance because I liked the music. It was definitely the right decision, and I figure I still have plenty of years to learn how to do a back flip. Do you have a pre-performance ritual? Yes. But it differs for every show depending on what I need. I’ll run through the show in my mind, warm up certain moves or double check sticky moments. I usually have specific music I will listen to to get hyped, or into character, or calm my nerves if they are along for the ride. Where/What are you doing now? I segued into a full time circus career in 2013. I have performed aerial internationally, and now am an adjunct professor of Aerial Acrobatics at Muhlenberg College and Pace University. In the past few years I have spent more time crafting lectures and a full college course in traditional American circus history for Pace. But at this very moment, I am on the train riding home from a day teaching dance to first graders in Queens. Dance will always be with me in one way or another! What is your favorite style of dance? I’ve always been mesmerized by the tango and flamenco. I have no idea how to dance either one, but I absolutely love watching them. In both, there’s deep sensuality and emotion to the movement, and yet a casualness in the form. Do you look up to anybody?Anyone with honed self-discipline and excellent time management skills. People who finish things. All of my beginner aerial students for their bravery. Caregivers. People who fight tirelessly for other people’s rights. When and how did you decide to pursue dance as a profession? When I was 9 years old I watched Teresa Nugyen perform a solo at my local studio’s annual recital. She had just been crowned Miss Dance of America that year, and I loved everything she did. I was entranced. And I felt something. To this day, I can’t pinpoint the feeling, but I felt something. I was hooked. I specifically remember thinking, I want to do that. I CAN do that! I want to be on stage, and I want to make people feel something. What do you like to do when you are not dancing? Hike, read, color, and lounge on the couch binge watching something fabulous. Do you prefer dancing barefoot or in socks, or any other shoe? Barefoot, for sure. Who is your celebrity look-alike? Some people say Natalie Portman. If you could live anywhere in the world, where would that be? New Zealand. But only for a little while. I’m a New England girl at heart. What was your experience like in the creative process of Encore? Do you have a favorite memory? I had so much fun working on Encore with Danny and the company!! I graduated from the University of the North Carolina School of the Arts in 2006, and moved to New York City right afterwards. 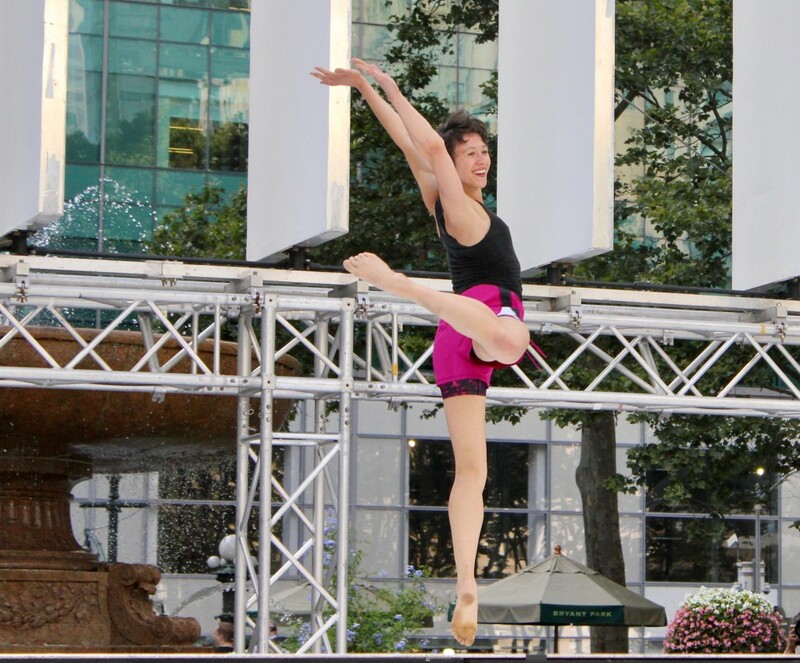 Dancing for the Daniel Gwirtzman Dance Company was my very first professional dance job! I remember feeling very excited and very nervous. Danny’s work was very challenging for me at first, and although I loved doing it, I didn’t feel I was very good at it. It was quick, incredibly musical, and there was a lot of fast footwork and changes of direction. I had always thought of myself as a slow, big mover- better at adagio, traveling across the floor, and grand allegro. It took me a little while to pick up Danny’s style, but slowly and steadily I did, and then I felt like I was DANCING!!! 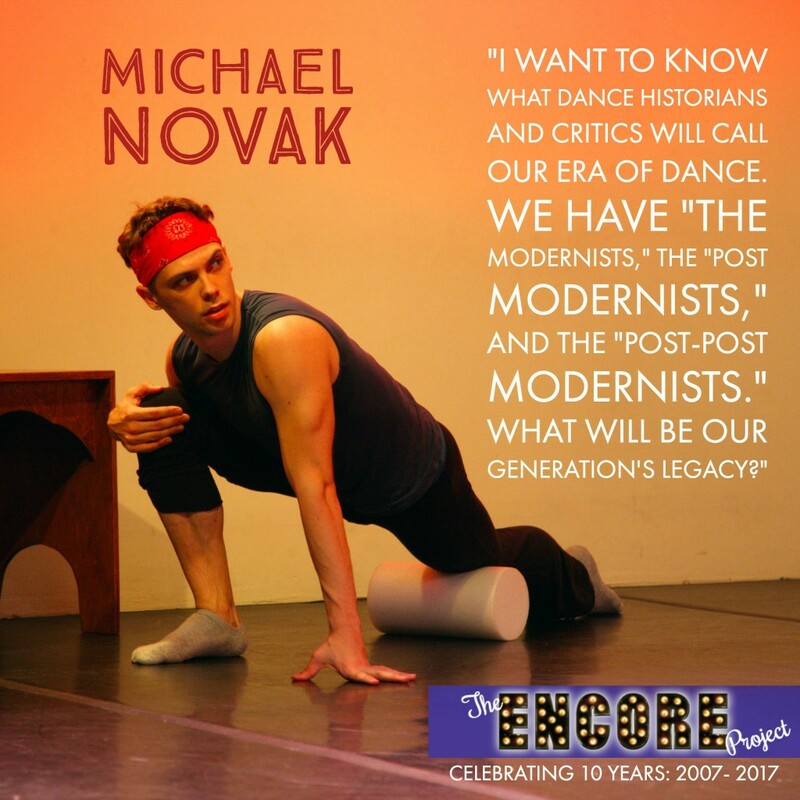 One of my favorite memories is performing Encore at Joyce Soho- the premiere of the full length work. Where do you see yourself in 10 years? In 10 years I see myself living in a house outside of the city, with my husband Ben, and perhaps raising a child there. I see myself continuing to teach Yoga a few times a week, going for long hikes and long runs whenever I can, cooking lots of delicious and healthy foods, tending to a garden, and enjoying a rich, relaxing life outside of the city that I love. What is some advice you would give upcoming dancers? Be yourself in the dance…in any dance. When taking on a role that someone else has done already, learn from them, but then work to find your own voice within the dance. I have learned so many dances from watching videos. Visual recordings are a great tool, and learning steps and style from them is a great skill to have. However, I often found myself trying to look exactly like the dancer in them. That, or wishing I did. My time and energy would have been better spent focusing on what my own body looked like doing the steps. How did you get into dance? My mom enrolled me in my first ballet lessons when I was six years old. I enjoyed it for that year, but the following year I told her that I wanted to do sports. The drive to dance came back to me when I was eight years old. I always loved to move as a kid, and I was very energetic and very creative. Dance satisfied me in every way. Do you have a pre-performance ritual? It was always to just try to breathe- I always got super nervous before shows! Breathe and do lots of push-ups. Where/What are you doing now? I retired from the Mark Morris Dance Group in January 2017. Since then, I haven’t danced! I have been teaching Yoga at an awesome studio in Brooklyn called Tangerine Hot Power Yoga, as well as at Crunch, where I teach a class called Antigravity Yoga. What is a professional goal you have for yourself? In terms of dance, I reached my goals. 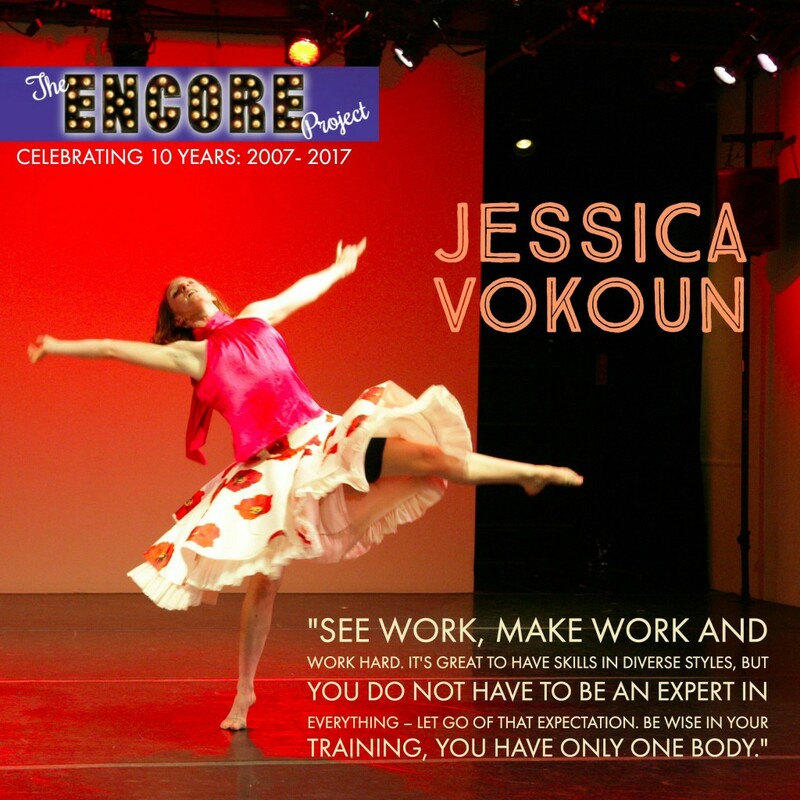 I danced professionally in companies, and toured the world! Now I am figuring out for myself what I would like to do outside of the dance world. One idea I play with is opening up my own Yoga studio. What is your guilty pleasure? Right now my favorite guilty pleasure is ordering in burritos, drinking a good stout, and watching a good movie with my husband. What is your favorite dance movie? Haha my favorite dance movie is Center Stage. I saw it when I was 16, a time that I was realizing that I wanted to be a professional dancer. At that young age it really touched me, and because of that, it will always be my favorite. Later, I watched it on a tour bus, with the Mark Morris Dance Group. We all shared a lot of laughs re-watching it. What is your favorite food? This changes for me all the time! A long standing favorite “food” for me is cake 🙂 Yellow cake with white icing specifically. I have also always loved vegetable lasagna. What do you like to do when you are not dancing? I love to run! I am slow, but can go far. The other day I ran to Coney Island and back- 20 miles, just for fun. One day I’d like to run my own Ultra marathon. Besides that, I love to read, cook, watch movies, and sit outside with a glass of wine and good company. Do you prefer dancing barefoot or in socks, or any other shoe? I always loved dancing in socks!!! I always felt I could move better when I was wearing them- more fluidly. It was a dangerous thing to wear socks in all rehearsals, then have to dance barefoot for performances, but nonetheless I did it. If you could live anywhere in the world, where would that be? I would live in Australia, if it weren’t so far away from my family. I’ve been there twice on tour, and fell in love. Both cities I went to felt like they were centered around health and happiness. The people I came in contact with were so friendly and welcoming as well. Oh, and there was so much sunshine!!! What is your spirit animal? Why? Whatever animal is crazy active during the day, likes to be constantly moving, then sleeps a long long time at night whenever possible. Who is your celebrity look-alike? I’ve been told at various times in my life that I look like Rashida Jones. Anyone who ever tells me that gets a huge hug! 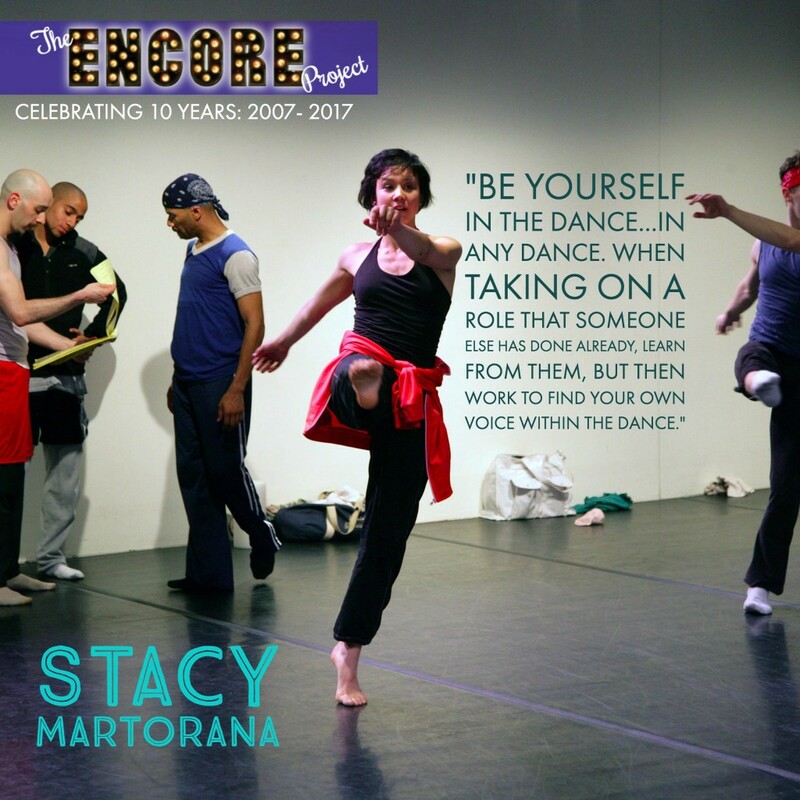 What was your experience like in the creative process of Encore? Do you have a favorite memory? I remember rehearsing the “Harlem Congo” and “In the Good Ol’ Summertime” relentlessly with Madeline Hoak. I also remember I had a really bad bronchial infection during the premiere and was on two inhalers. I thought I wasn’t going to make it! Where do you see yourself in 10 years? In ten years I hope to have earned my MBA and to be working for both for-profit and non-for-profit organizations in strategic marketing and consumer engagement. What is some advice you would give upcoming dancers? When deciding to take a job, consider the following: every job you take should offer you two of the three following qualifications: (1) great experience, (2) great pay, and/or (3) great people. Try to never take a job that only gives you one of these. Hopefully, your career is filled with jobs with all three! Do you have a pre-performance ritual? There are two things I do before every show: nap and brush my teeth. What is your guilty pleasure? I take wine classes throughout the city. I study it rather seriously. What’s the most unusual thing in your dance bag? A bag of almonds (not to mention every therapy toy imaginable). If you could live anywhere in the world, where would that be? Italy. Definitely Italy. What is your spirit animal? Why? Wolves. Ever since I was a child, it was a wolf. There was something mysterious, elusive, wise, and majestic about them. What is the one question you want answered? I want to know what dance historians and critics will call our era of dance. We have “the modernists,” the “post modernists,” and the “post-post modernists.” What will be our generation’s legacy? What was your experience like in the creative process of Encore? Do you have a favorite memory? I had a blast in the studio with Danny as he was building Encore. My first encounter was learning the last few movements for a show Danny had at LIU. We worked on Summertime and Indiana [the finale]. One of my favorite memories came later, while working on the opening sequence of dances which we called The Rehearsal (am i making that up? i think that’s what we called it!). Automobile Ride, Rose Room, Porter Stomp…these were such lovely dance vignettes that tumbled out one after another. I remember thinking I’d never be able to get the King Porter Stomp up and running with the speed and precision, but it sure was a blast to keep on trying! And the cast! we had such a great time goofing around in the studio together! That first season at the Joyce Soho was such a big deal to me. I was so excited and at the same time, terrified with nerves. I had never performed anything like it before. Where do you see yourself in 10 years? In 10 years I hope to have completed my Masters in Occupational Therapy. I’m looking to build a second career that enables me to translate my years of investigating movement and solving movement tasks into a practice where I can work with populations that need help in solving simple movement tasks to better serve their everyday lives. I anticipate continuing to teach for the Trisha Brown Dance Company and the Merce Cunnigham Trust and hope that I’ll continue to have opportunities to perform from time to time. Whatever happens, I know there will be movement! What is some advice you would give upcoming dancers? Dance has never felt like a very linear career to me. There are peaks and valleys and lots of plateaus. Learning to navigate that terrain with patience and devotion is a priceless life lesson. How did you get into dance? I started dancing when I was 4 in a neighborhood basement where Miss Paula would arrive in her fairy princess costume once a week, put on the “hippopotamus rock” and guide us all in swaying our tutu clad hips back and forth as we chasséed around the carpet. Thirty years later, I just never wanted to stop! Do you have a pre-performance ritual? I’m still trying to figure out the perfect one! What are you doing now, what have you been up to? I’m on the train returning from staging an excerpt of Merce Cunningham’s Fielding Sixes at St. Paul’s School in Concord, NH. We had a great three weeks together, and Fielding Sixes, with it’s relentless rhythms and dense choreography was both a huge challenge and loads of fun for them. I touch down in New York for a few days before heading to the Walker Art Center in Minneapolis where I will be co-staging Merce’s Field Dances with Patricia Lent on a group of local dancers to celebrate the unveiling of the new sculpture garden. After that it’s back to New York to teach for the Trisha Brown summer intensive before taking off to Zurich, Switzerland to perform some of Trisha’s Early Works. Do you prefer dancing barefoot or in socks, or any other shoe? Barefoot. What is your favorite dance movie? Singin’ in the Rain. I watched it hundreds of times on VHS growing up. I recently got to see it on the big screen with my family after Debbie Renoylds passed away and I was moved to tears! I had forgotten how much i looked up to her as Zelda. What do you like to do when you are not dancing? There’s nothing that relaxes me more than spending the day cooking. What is your favorite food? Tacos! Always my first go-to when I get back from touring. What was your experience like in the creative process of Encore? I feel fortunate to have been part of the very beginning of Encore. I was able to work with Danny at The University of Wisconsin-Milwaukee during the initial creative process. We spent hours in the studio trying out phrases and partnering work. I especially enjoyed creating the duet “Ain’t She Sweet” and the ensemble finale “Indiana”. The music and Danny’s charisma fueled our long rehearsals. 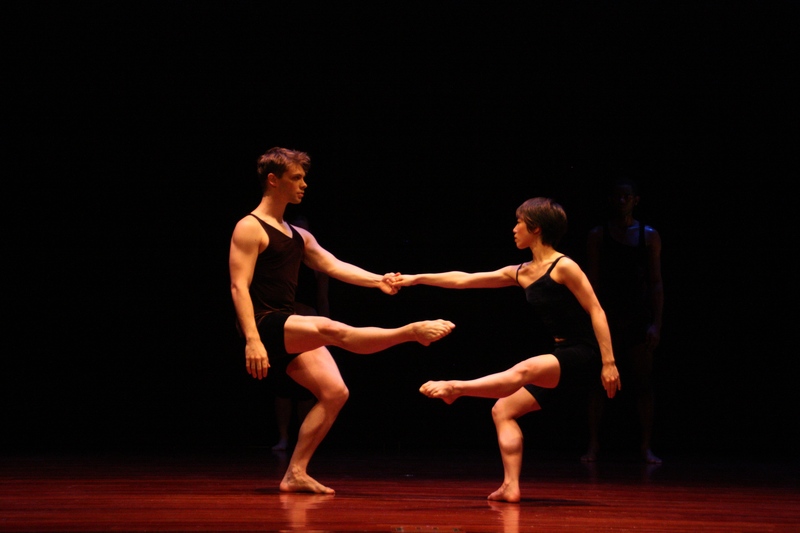 Presenting the original Encore at UWM’s Dancemakers was so rewarding. I’ve performed with four different Encore ensembles since, and each group has been unique and full of talented performers. What is some advice you would give upcoming dancers? See work, make work and work hard. Go see live performances of all styles and abilities, watch historical and current work online, take notes and evaluate what inspires you. Practice making choreography (even if short phrases) on a regular basis. Discover your personal movement vocabulary and style. Work with as many choreographers as you can. Be generous and open, but know what is expected. Do the work: take class regularly, find a class in which you feel successful, but also take classes that challenge you and are out of your personal comfort zone. Its great to have skills in diverse styles, but you do not have to be an expert in everything – let go of that expectation. Be wise in your training, you have only one body. Where/What are you doing now? I am an Associate Professor of Dance at the University of Tulsa. What is your favorite food? I’m a true Wisconsin native: Cheese and Ice cream are my weaknesses. What do you like to do when you are not dancing? Hang with my two-year old, walk my dogs, yoga, travel, read. Who is your celebrity look-alike? I’ve been told Bryce Dallas Howard or Florence Welch…but that was a while ago.